Photo Courtesy of Gregg Martin. Copyright 2014 Gregg Martin Photography. “A warrior acknowledges his pain but he doesn't indulge in it. That is Stephen Achilles Garcia. 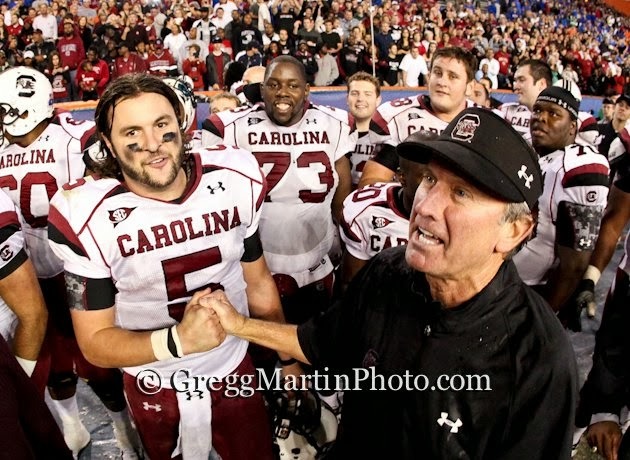 After the heart breaking loss to UGA in 2009, did you have a personal goal to never lose to them again? In truth, you were only one play from going undefeated against them. Garcia: "That game was tough to lose. We played so well and were just a few plays from winning it. The goal, every season, was to win the SEC East and play for the SEC Championship. Georgia historically has beaten us and I wanted to be part of bucking the trend. Beating Georgia my senior year in Athens is definitely one of my highlights. There's no better feeling than beating your rival at their house!" In 2010, it would turn into the feed Lattimore show. Was Georgia's secondary that good that day or was it a matter of running it down their throat because they couldn't stop Marcus? Maybe a mixture of both? Garcia: "Our O line played outstanding that game. That was Latt's first game in which he showed what a workhorse he really was. We knew their secondary was stout that year and we had to run well to keep their offense off the field and ours on it. It helps so much as a QB to have a back like Lattimore that can set up play action, and we did that several times this game for some huge gains." Only three people really understand the importance of the exchange from center to QB & QB to the RB. At any point did you say to yourself, "I know they know whats coming, so maybe I will audible out", did you audible at any point to change protections because you saw things when you guys lined up? Garcia: "We absolutely would audible. If I saw something in the defense that I was 100% sure on, I would change the play. However, our offense as a whole would usually look to the sideline to see if the coaches wanted to make an adjustment." Most people downplay the importance of the QB when a running back is getting the work load. All they see is the running backs work. They don't see the QB changing protections according to how the D lines up. It's gotta be something to see, when it works out to perfection. Why do you think the passing game wasn't as efficient as it definitely was capable of? Were you sick, just off or a mixture of different things? Bad play calls? Garcia: "I think it was mainly just that they couldn't stop our running game. There were definitely games in which the play calling was a little suspect, and I usually got blamed regardless. Haha. Playing QB is such a mental position and you have to get some positive reinforcement every now and then." Winning this game was HUGE, how good did it feel watching the defense keep them out of the end zone continually & giving you an opportunity to sign, seal and deliver the win. Garcia: "Throughout my time at SC, the defense was usually on point and flying around. We had an excellent defensive coordinator and assistant coaches that really pumped their guys up to play well." Being from Florida, do you share in the massive dislike for UGA? Did you grow up a Florida fan? Who was your favorite squad actually? Who had a great shot at getting you, other than USC but didn't and why? Garcia: "My uncle actually went and played at FSU so I was a FSU fan as a kid, but not a huge one. I actually wasn't that big of a college football fan either, I was just a FOOTBALL fan. My other top choices included Louisville, Oklahoma, Ole Miss, and Florida. I wanted to get out of the State of Florida but not too far, so UF and Oklahoma were kind of eliminated, but Ole Miss and Louisville were very high on my list along with SC." After the game was over, we witnessed something incredible, we beat UGA, Lattimore would show out, you would be more of a game manager, which without proper exchanges and STILL running the show, things could have easily been different. Anything special you thought or said to Lattimore AND lastly....did Georgia pop in your mind when you laced em up for Alabama? It seemed like you were EXTRA motivated for this game? Garcia: "I just told Latt to keep grinding and that he is awesome haha. He really was a great player, but an even better teammate. And honestly, before we played bama I just told myself to have FUN. I didnt really say that to myself often, for reasons I cant explain online, but nonetheless, I just told myself to sling it, play with emotion and beat these damn guys. Obviously, everyone is gonna be a little more pumped up playing against the #1 team in the country, but I just played like I would a HS game, just out there having FUN!"